Keelor became the first Indian pilot to shoot down a jet in air to air combat. The Sabre was armed with the sidewinder missiles, which makes the feat even more remarkable. It was the first time that the Gnat fired its guns in anger. it was previously untested in combat. But the fight was not over yet. While Keelor was dealing with the Sabre, Pathania spotted two more Sabres and engaged them even as a F-104 Starfighter was noticed up above. The Starfighter broke Pathania's attack on the Sabre and even as the Indian Pilots regrouped, would engage reheat to fly away from the area. Murdeshwar had to go through the frustration of not being able to warn Pathania of the incoming F-104 Starfighter due to his R/T becoming snagged. He had noticed that while he was receiving incoming transmissions, he could not transmit himself thus was unable to warn Pathania about the Starfighter. Fg. Off. Krishnaswamy at one point of the combat found the Starfighter on his tail, then overshoot him and present him with a nice target, but as Krishnaswamy later admitted, he was so awestruck at the sight of the sleek and beautiful fighter that he forgot to open fire. The Gnats were now getting short on fuel, and they rendezvoused to fly back to base. It was back at base amidst the celebrations that they discovered that Sikand was missing. Initially it was thought that Sikand must have been lost in air combat. In fact unknown to the Indian Pilots, Sikand had lost contact with the formation as well as his bearings. Most aircraft at that time did not have radars, or GPS systems or navigational aids. All the pilots had to use their maps and the aircraft compass to do their navigation back to base using visible landmarks. Gnat was low on fuel, and over unfamiliar territory, and after some flying Sikand found an airfield and in a foolish decision decided to land there. Sikand was under the impression that this was an abandoned airfield in Indian territory. But he should have known better that there were not many such airfields. Ultimately after he landed to his rude shock found out that the airfield was the Pakistani airfield of Pasrur. But before he could recover from the shock, he was taken POW and the aircraft was captured. After the aircraft was captured, it was flown to Peshawar by Flt. Lt. Saad Hatmi of the PAF, who had previous experience on Gnats during a stint in U.K. The aircraft was flight tested thoroughly by the PAF. The Pakistanis claim that Sikand surrendered and landed at Pasrur after being intercepted by a Starfighter flown by Flt. Lt. Hakimullah. India had always maintained that Sikand landed the Gnat at Pasrur by mistake thinking it was Pathankot, but not much has come to light in this regard after that. While it is true that Hakimullah was in the same area as the Gnat was, it is conjecture to say that Hakimullah forced Sikand to land at Pasrur. Sikand later went on to become a Air Marshal in the Indian Air Force even earning a AVSM, which seems to suggest that it was more a mistake than a deliberate act of surrender as the Pakistanis would have everyone believe. Today Gnat IE 1083 is on display at the PAF Museum at Karachi. Squadron Leader Brijpal Singh Sikand, Commander of an Indian fighter squadron, surrenders to a PAF F-104 in combat. 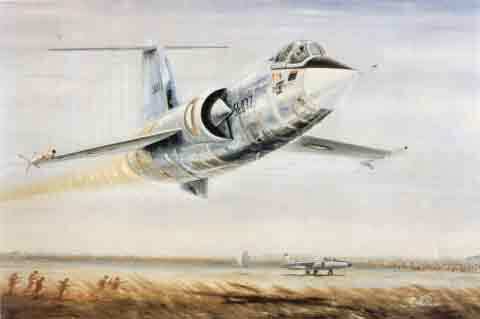 The painting shows him landing his Gnat fighter at Pasrur, a Pakistani airfield near Gujranwala. The F-104 was flown by Flight Lieutenant Hakimullah who became the Air Chief two decades later. 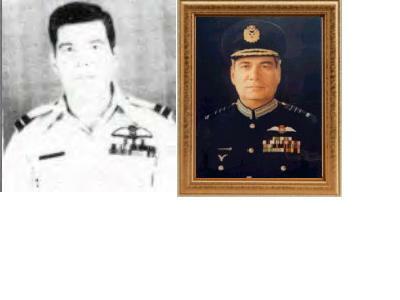 Sikand was taken prisonar and later rose to be an IAF Air Marshal. This encounter was the most unusual event of the 1965 Air War. SIKKY's Gnat: Sqn Ldr Brijpal Singh Sikand, of No.23 Gnats Squadron forcelanded his Gnat at Pasrur on September 3rd, His aircraft was captured intact by the Pakistanis and testflown extensively much later at Peshawar. This aircraft is on display at the Karachi PAF Museum today.